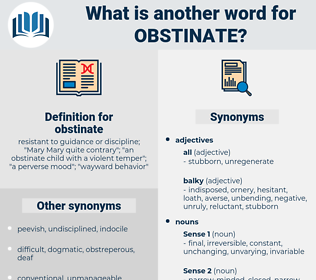 What is another word for obstinate? 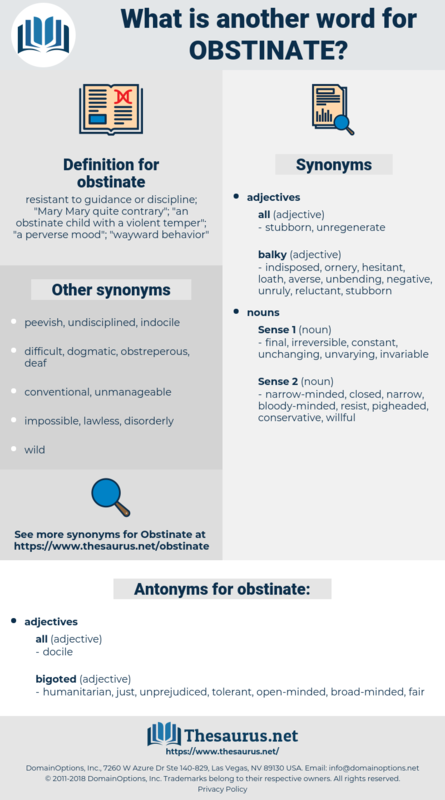 resistant to guidance or discipline; " Mary Mary quite contrary"; " an obstinate child with a violent temper"; " a perverse mood"; " wayward behavior"
intransigent, headstrong, relentless, diehard, die-hard, dogged. humanitarian, just, unprejudiced, tolerant, open-minded, broad-minded, fair. good-natured, happy, nice, pleasant, easy. eradicable, intermittent, occasional, temporary, curable. incautious, progressive, exaggerated, radical, left-wing, liberal. alike, harmonious, agreeing, concordant, accommodating, obliging, correspondent, similar, homogeneous, like. foreign, new, unique, strange, original, different, exotic. cooperative, helpful, submissive, yielding, amenable. flexible, placable, teachable, receptive, wavering, agreeable, gentle, accepting, complaisant, reasonable, irresolute, regenerate, slavish, temperate, complying, undecided, dutiful, governable, acquiescent, responsive, willing, persuadable, subservient. But the chauffeur was obstinate. He shook his head in a most obstinate fashion, giving his visitor fair warning not to go too far. hang on, hold on, persevere, persist, hang in.